Perfectly Plump? Say it ain’t so! I shared it with some horse friends who thankfully agreed. I called Dr. Rebecca Gimenez, president of Technical Large Animal Emergency Rescue. Gimenez lectures internationally on horse emergencies and disasters and has seen her share of skinny (ie, neglected and starving horses). Funny enough, she saw the catalog cover and had the same reaction. More and more, she said she sees obese horses where she goes. The problem is local (Gimenez lives in Georgia), national, and sometimes in Europe, too. “Just today, I went to visit a horse that was reported as supposedly 1 or 2 on the Henneke Body Condition Score. I went to check it out. The horse was maybe a 4. It was fine. But on the way home, I saw these horses in a field. They were horrifically fat. 7, 8, 9 on the scale. Fatter is not better,” said Gimenez. Read more about HBCS or download a helpful scoring chart. Just like dogs, cats, and humans, horses can be seriously harmed through overfeeding. And just like other animals, it can be a painful and expensive endeavor to maintain them and bring them back to a more appropriate weight. Can we say, chronic laminitis, Cushings, diabetes, insulin resistance, kidney failure, founder, added stress on joints? Lots of discomfort for your horse and your wallet. Gimenez said our society has become more and more accepting of heavy horses. It reminds her of the age of European Romanticism when obese humans and horses alike were painted admirably. 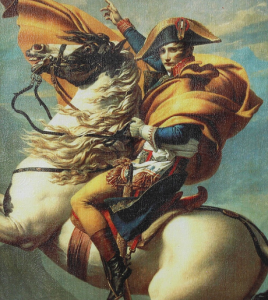 Remember Napoleon on his handsome horse? Maybe he’s so stressed because he’s overweight and working hard. As you contemplate fitness, remember to consider your horses’ condition as well as your own. As Randy Rieman mentioned in his Focus on Fitness remarks. 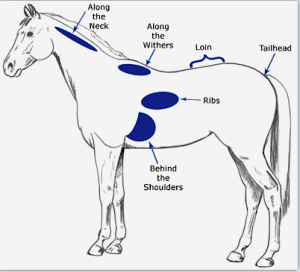 “It’s part of the responsibility to the horse: the trifecta of saddle fit, horse fitness, and rider fitness. Both under and on top of the saddle, fitness matters,” he said. Read more about our Focus on Fitness. Check out Harmany Equine’s grazing muzzles. Check out slow feeders from Hay Pillow. Read about a miracle rescue: Honey goes from 1-2 to a healthy 4 on HBCS. 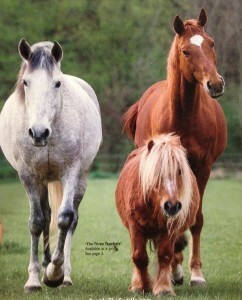 I saw the same catalog cover and was thinking at least one of those horses had to be pregnant. 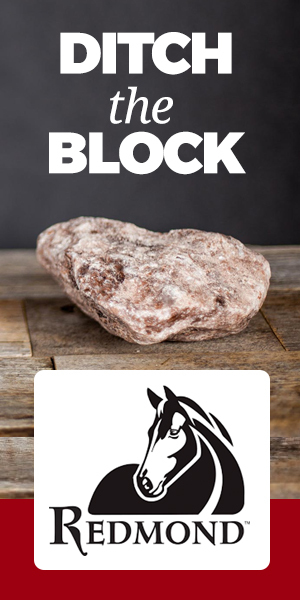 It has become prevalent in horse circles to “over love” your horse. Loving a horse too much can come through over-feeding, blanketing, keeping them stalled so they don’t get dirty, and checking on them every hour or so because the owners are afraid to let them be a horse. On the other hand, we see loads of neglect and abuse in the horse world. The humans that can afford to care for their horses want others to look at their horse and see them well-cared for and that usually translates to being “pleasantly plump.” Both extremes in care are detrimental to the horse. Finding the middle ground takes education and a desire to learn what REALLY makes a horse happy and healthy. Thanks for the write-up!! Thank you for bringing this up and letting me comment on it, Maddy. I also went to see the horses at the SPANISH RIDING SCHOOL in Vienna last November.. and was horrified to see that all of them were fleshy 7.5, 8 and even some 9 body condition scores – and all of them were being ridden and asked to perform at the haute ecole levels of dressage. I felt very sorry for them. I changed my horses’ diet from pelleted feeds to plain old racing oats. That’s what they used to feed horses in the old days. They get additional beet pulp in the winter, a vitamin supplement, mineral supplement, flax meal, some soybean meal and soybean oil in the cold winter months. My old horse is blanketed when he looks unable to keep warm, like the other day when it was 19 degrees below zero. The pony is fine no matter how cold it gets. They are probably a 4 or 5 on the scale, but the summer months are very difficult. They wear grazing muzzles and the oats go down to a token amount but I still have a hard time keeping their weight down when the grass is green.